"My father taught me how to make this recipe when I was a little girl. It is very easy to make. This recipe contains raw eggs. We recommend that pregnant women, young children, the elderly and the infirm do not consume raw eggs." 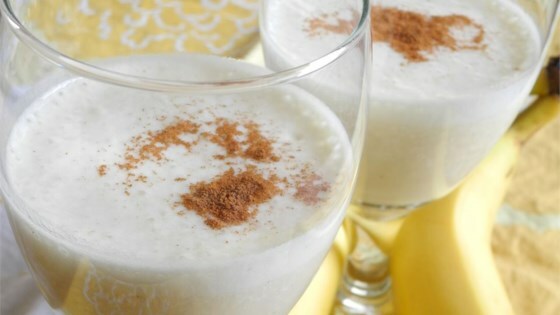 In a blender, combine banana, milk, vanilla, egg and sugar. Blend until smooth. Pour into a tall glass and top with a pinch of cinnamon. DELICIOUS! I used a frozen banana, and I think that really made it extra good. I also used half the sugar, but next time I will probably only use 1/4 of the sugar. This was really good. I used splenda instead of sugar and no egg and I also put a few pieces of ice in it. Thank you. I love this recipe! I can drink one of these everyday, and it's good for you! Good for breakfast. I added strawberries along with bananas. This recipe was alright. It was pretty thin even with the egg. Next time I will try freezing my banana first for more texture and wait until it is very ripe. Decent recipe to play around with.